The What: The Ricoh PJ S2240, PJ X2240, and PJ WX 2240 are high-performance DLP projectors at entry-level price points. The What Else: The RICOH PJ S2240, RICOH PJ X2240, and RICOH PJ WX2240 can display images from PCs, cameras, video cameras and DVD players. 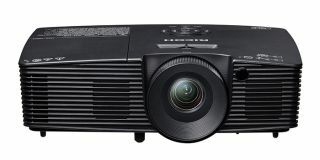 The projection systems provide a range of resolution—SGA, XGA, and WXGA resolution respectively—at a brightness of up to 3,100 lumens (3,000 for the RICOH PJ S2240 and RICOH PJ X2240). They project images of 30 inches to 300 inches measured diagonally, but are as easy to carry as a laptop, weighing only 5.75 pounds in a 12.5-x-9-x-4-inch package. The RICOH PJ S2240, RICOH PJ X2240 and RICOH PJ WX2240 include an HDMI input for display of Blu-ray movies, a high contrast ratio (10,000:1) for sharper detail, and whisper-quiet operation at less than 34 decibels. An Eco Mode option reduces power consumption, extends lamp life to 6,000 hours and further reduces noise. The systems include a remote control and all cables. Glasses for viewing 3D media are an available option for all Ricoh DLP projectors.